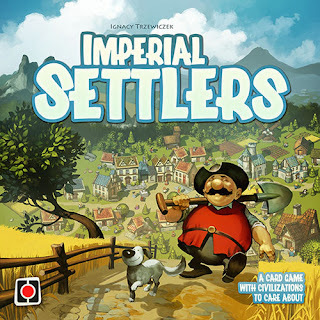 Imperial Settlers is a card game with civilization to care about for 1 to 4 players. 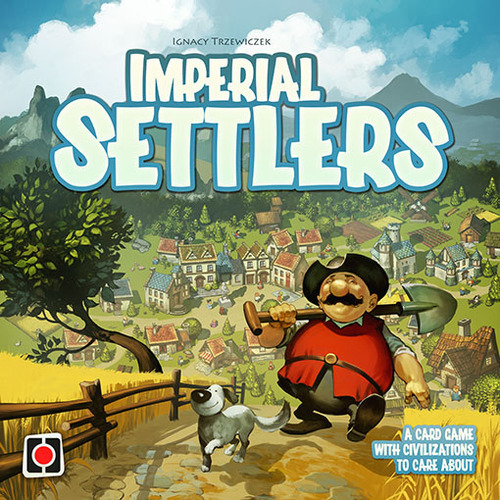 Four mighty mighty empires discover new lands full of resources and opportunities. Players have five rounds to explore new lands, build buildings, produce and trade resources, conquer enemies, and score victory points. Settle your own powerful empire as Barbarians, Japanese, Romans, Egyptians. take one of the many building/location cards and raze it or use it to make a deal. Each faction plays with it's own unique twist. Long anticipated, Orléans is finally here. This is a worker placement game with a twist. Players accumulate additional workers that get placed in a bag. A random draw determines which workers will be available next turn. There are multiple types of workers all with multiple uses. 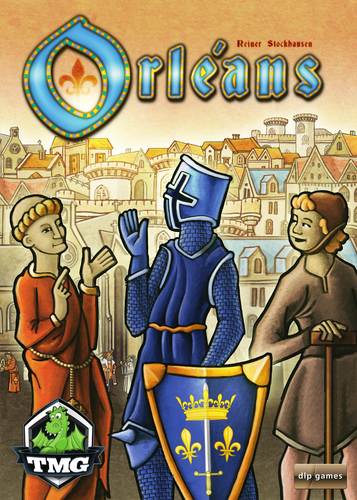 The goal of the game is to achieve dominance in various areas in medieval France. You will get goods, coins, and victory points via production, trade, development, and by committing to the common good. Players can't possibly do everything they want on a turn. And, there are many paths to victory. The Bloody Inn is for those of us with a warped sense of humor. Each player owns an Inn and is competing to accumulate the most wealth from their guests. Being greedy Innkeepers and not wanting to arouse the suspicions of the local police, a diabolical plan was hatched. You all realized it's less of a problem to steal from your guests if they are dead. However, disposing of the bodies is such a headache and you can't have them just lying around. Munchkin Christmas Lite is a 110-card stand-alone game that works well as an introductory game for those not familiar with Munchkin. Additionally it can also be used as an expansion for other Munchkin games. Dragon Slayer is a fast dice game with a twist. Each turn you'll take chances and press your luck to find and defeat as many dragons as you can. But when you decide to end your turn, everyone else gets a chance to challenge you to continue. Accept their challenge and you can score big - walk away and you'll leave most of your points on the table. Pandemic Legacy - Season 1 is a unique and epic cooperative game. Some of the actions you take in Pandemic Legacy will carry over to future games. Playing through the campaign, you will open up sealed packets, reveal hidden information, and find the secrets locked within the game. Characters will gain scars. Cities will panic. Diseases will mutate. No two worlds will ever be alike! In Letters From Whitechapel one player assumes the role of Jack the Ripper while the other players assume the roles of detectives pursuing him in Victorian London. 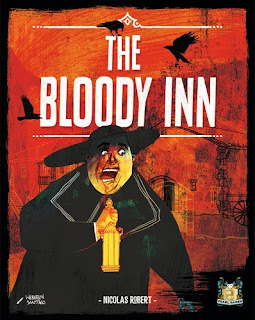 Jack the ripper must outmaneuver the detectives in the tangled streets of the Whitechapel District to escape after committing his horrible murders. Meanwhile, the detectives must use clever deduction and their superior numbers to hunt Jack the Ripper down before he can kill again or elude them forever. 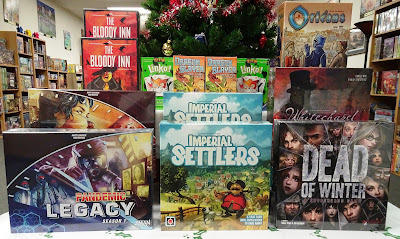 It's the most wonderful game of the year in Holiday Fluxx, the ever-changing card game. Holiday are filled with gifts, candy, firends, and good cheer. Bring them all together and mix them up for some unforgettable memories. Fluxx is all about change. You don't know what the winning condition is until someone plays a Goal card. If you don't like the Goal, play a new Goal card. If you don't like the Rules, play a new Rule card. Collect the Keepers and avoid the Creepers. Match the Keepers to the Goal and win. Linko an action-packed card-snatching card game for 2 - 5 players. Players take turns playing number cards. The more cards of the same number you play, the more points you receive. If you can play the same amount of cards at higher values than your opponent, the cards and points are yours... otherwise your cards can be stolen. Stealing can be good, but if you can't use them, they'll cost you in the end.